I mean, ARE clowns people?? Either way, this is the happiest about *possibility* I remember being since Bernie Sanders was still running for president. 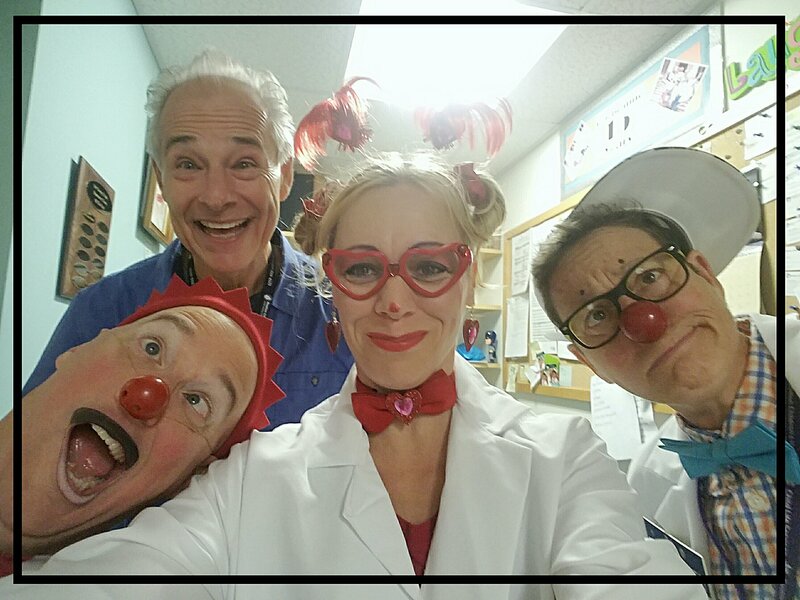 I just completed my third and final round of auditioning to become part of the Laughter League of medical clowns at Children’s Hospital in Boston (and Providence). As I write they’re auditioning the other two finalists for the current job opening. The very experience of participating in this audition process has been a privilege of a lifetime. After performing full time for 20 years, tracking & admiring the hospital clowns for many of them, I have never felt more prepared or destined for a line of work in my life. Yes I love performing in nearly all of it’s forms and venues. Quite often it’s for privileged people on some of their best days. However this is something quite broader, deeper, more profound, humbling, and the privilege would be all mine. PLUS it’s all about PARTNERSHIP and PLAY with fellow good hearted, like minded yet thankfully unique [knuckleheads] characters like these (see above). ● Fought back tears* as my ukulele playing brought a smile to the first patient we encountered, in Pre-Op. When we fawned over her stylish helmet and tutu and asked what she’d be wearing tomorrow, her parents cheerfully told us; four new casts and a tutu. ● Improvised the “visual aid” side of Doc Skeeter’s “lecture” about *The Platypus* for a 7 year old boy for whom perhaps I needn’t have entered prat-falling into my partner, but whom ultimately did get caught up in our “lecture,” even if just at the incredulity of seeing two grown individuals behave so very incompetently. ● Helped elicit a dizzying array of silly moves in Doc Skeeter’s repertoire through all the verses of Knick-Knack Pattywhack for a lovely teenage boy with Down’s Syndrome who thankfully loved us implicitly, as his mother reviewed his medical records with the nurse. ● Spent a great deal of time knocking and failing and trying to figure out how to operate the door to a patient’s room with Dr. Mal Adjusted (who at one point feared she’d actually hit me in the face with it, when in fact I’d simulated it with a knap just like a real live clown). ● Spent a likewise amount of time trying & failing to correctly introduce ourselves to a lovely girl, which turned into a game of “can we get Dr. Mal to stop talking and for how long?” She made it about 8 seconds but obvs I had to unzip her mouth -with the help of my kazoo- because of course she couldn’t breathe! One of the questions they asked me during debrief afterwards was did I find anything surprising? Honestly it was the degree and frequency with which my fellow clowns wholly. Cracked. Me. Up. Is my breaking character to belly laugh and guffaw an acceptable part of the job? Naturally, yes. As performers it is ever our job to uncover the fun -and thus create more joy to spread- wherever we go and roam in the hospital. Fingers and toes and eyeballs crossed. This entry was posted in art, Bernie Sanders, comedy, education, faith, family, health, Hospital Clowning, love, making art, music, patience, work and tagged audition, Boston Children's Hospital, hospital clowns, Laughter League, new job. Bookmark the permalink. How could they not hire you? You have birds flying around your head!